Ambassadors promote goodwill among potential students, current students and professionals. SoBA Ambassadors act as representatives of the School of Business Administration and encourage recruitment and retention of students to all undergraduate business majors. What are the benefits of being a SoBA Ambassador? 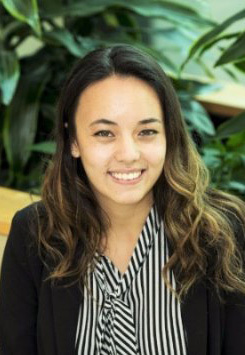 Asia interned with KPMG in San Francisco summer 2017 and currently works part-time for ATG. Andrew works for UM Catering and is Captain of the UM Men's Ultimate Frisbee Team in addition to Vice President of ASUM Club Sports Union. Advice for New SoBA Students: "Try to get out of your comfort zone early and often with trying new things in your academic life and social life. You'd be surprised with the amount of doors that will open when you get out of your comfort zone and meet new people!" What are the criteria to become a SoBA Ambassador? SoBA Ambassadors are volunteers chosen through a competitive process. The group will represent diversity in majors, hometowns, academic backgrounds and academic classification. SoBA Ambassadors will have excellent verbal and written communication skills and be well-rounded, degree-seeking undergraduate students. They will be professional, prompt and reliable in their commitments. Must commit to expectations and responsibilities listed above. Submit a resume, via email, to kathleen.tarkalson@umontana.edu. Notifications will be made via phone or email.